Laura Kurgan was interviewed about the Million Dollar Blocks project for the PBS documentary "The Human Face of Big Data." 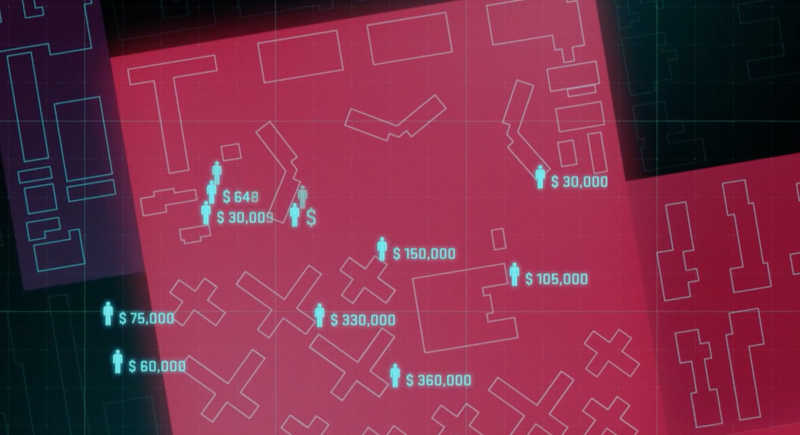 The documentary aired nationally on February 24, 2016 and featured Laura Kurgan speaking about the Center for Spatial Research's unique approach to mapping and data visualization: "And there is always that moment in data vizualization where you are looking at tons and tons of data. 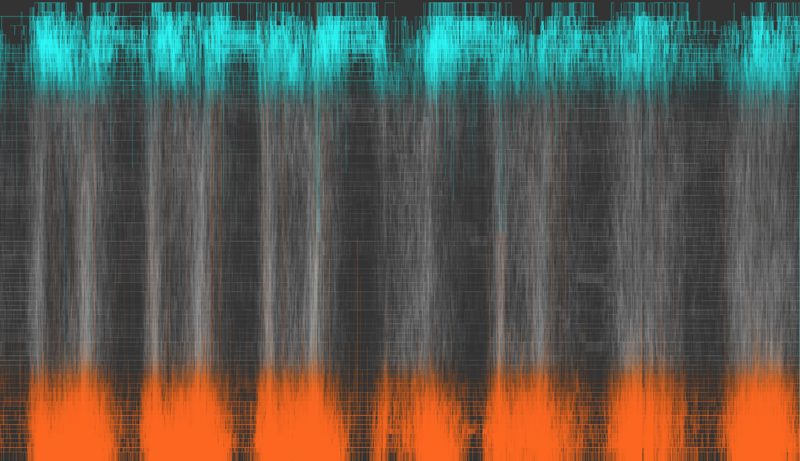 The point is not to look at the tons and tons of data but to look at what are the stories that emerge out of it." The Human Face of Big Data explores the impace of our current data-filled age: "With the rapid emergence of digital devices, an unstoppable, invisible force is changing human lives in incredible ways. Every two days the human race is now generating as much data as was generated from the dawn of humanity through the year 2003. The massive gathering and analyzing of data in real time is allowing us to address some of humanity's biggest challenges but as Edward Snowden and the release of NSA documents have shown, the accessibility of all this data comes at a steep price. This film captures the promise and peril of this extraordinary knowledge revolution." Al Jazeera's Ranjani Chakrabortty recently wrote an article about the impacts of incarceration on families and communities that drew on our Million Dollar Blocks project: "Each year, the U.S. spends $80 billion to incarcerate more than 2.4 million people. But when it comes to communities, the costs are even more staggering. A disproportionate number of inmates come from just a handful of neighborhoods in the country’s biggest cities. In this Brooklyn community, Augustine’s story is all too common. Brownsville has one of the highest concentrations of “million-dollar blocks” — places where the state is paying more than $1 million a year to incarcerate the residents of a single census block — in the country. And often, according to research from the Ella Baker Center for Human Rights, Forward Together, and Research Action Design, the burden of mass incarceration is left to women." 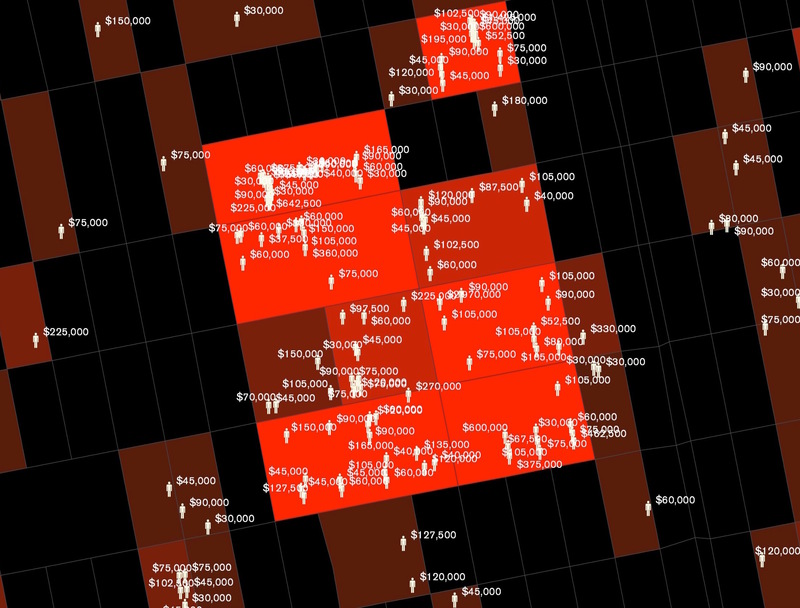 A new project led by Dr. Daniel Cooper of Adler University and Dr. Ryan Lugalia-Hollon, a writer and strategist, drews on our work on Million Dollar Blocks to map the incarceration landscape in Chicago. They used data collected by the Chicago Justice Project and built on research methods developed by the Spatial Information Design Lab. Through their research they've found that between 2005 and 2009 there are 851 blocks in Chicago with over $1 million committed to prision sentences. See their full project here. Emily Badger of the Washington Post reported the Million Dollar Blocks project "There are neighborhoods on the West Side of Chicago where nearly every block has been painted red — a sign, on the above map, that someone there was sentenced to time in an Illinois state prison between 2005 and 2009 for a nonviolent drug offense. 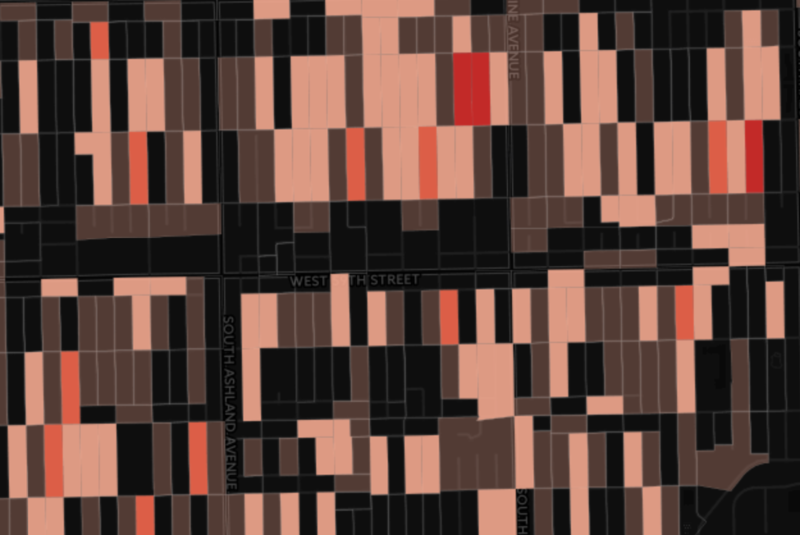 On several dark-red blocks [mapped here in Chicago], the missing residents are so many — or their sentences so long — that taxpayers have effectively committed more than a million dollars to incarcerate people who once lived there. 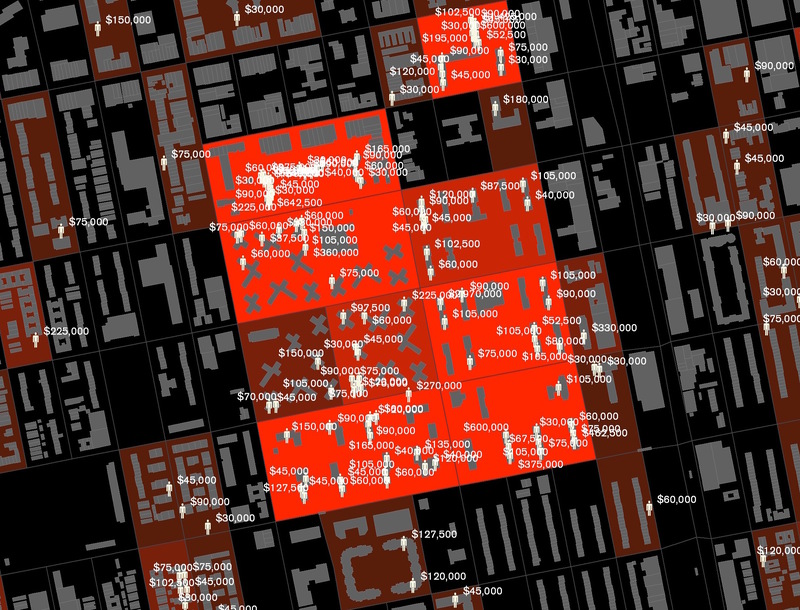 This is the perverse form that public investment takes in many poor, minority neighborhoods: "million dollar blocks," to use a bleak term first coined in New York by Laura Kurgan at Columbia University and Eric Cadora of the Justice Mapping Center. Our penchant for incarcerating people has grown so strong that, in many cities, taxpayers frequently spend more than a million dollars locking away residents of a single city block." The Justice Atlas of Sentencing and Corrections is an online tool for mapping the residential distribution of people involved in the criminal justice system. It uses aggregated address data to map the flow of people being removed to prison, reentering communities from prison, and the standing population concentrations of people under parole or probation supervision. Spatial analysis as a tool for transitional justice in Colombia. On the eve of an historic and controversial peace agreement in Colombia we have launched an investigation into the spatial characteristics of the decades long conflict between multiple state and non-state actors in the country. We have provisionally titled this research Conflict Urbanism: Colombia. Our work is still in the beginning phases. We have formed a relationship with the interdisciplinary M.A. Program in Peacebuilding at Universidad de los Andes in Bogotá. We aim to analyze and visualize the documented aspects of the conflict in Colombia in order to put forward policy recommendations for the transitional justice and peacebuilding process. These recommendations will be informed by rigorous mapping, spatial analysis, and in-depth research on the socio-historical context of the conflict. The project engages with existing efforts to construct diverse historical memory in transitional justice projects, especially those in Latin America, and at the same time brings new modes of visualizing violent conflict and its aftermath into discourses of truth and reconciliation. Our initial maps look at internally displaced peoples in Colombia and their patterns of migration over the course of the conflict using data from the Registro Unico de Victimas. By spatially analyzing and visualizing data about the victims of the conflict - which wasn't collected for this purpose - we are helping build the historical memory of the country, and in doing so, contributing to the ongoing peacebuilding process. In these maps lines connect cities where people were displaced to the cities where they moved to. Often we can connect large displacements with specific historic events such as significant massacres, where such as in Bojayá in 2002 when a massacre caused nearly the entire town to relocate. Juan Francisco Saldarriaga will be leading a workshop on how to download API data using Python in the context of the Art of Data Visualization conference to be held at Columbia University on April 7th. The workshop will take place at the Digital Social Science Center (215 Lehman Library) from 10:30 AM to 11:30 AM. Here’s a description of the workshop: This workshop will introduce you to basic Python programing and to social media APIs. Students will learn how to write basic Python code to import data, query API's and extract information, and export the results in formats that can be used for analysis or mapping.